Todays Hearing at Coleraine District Judges Court where Ciaran Shiels of Madden & Finucane is representing Matthew Stirling. 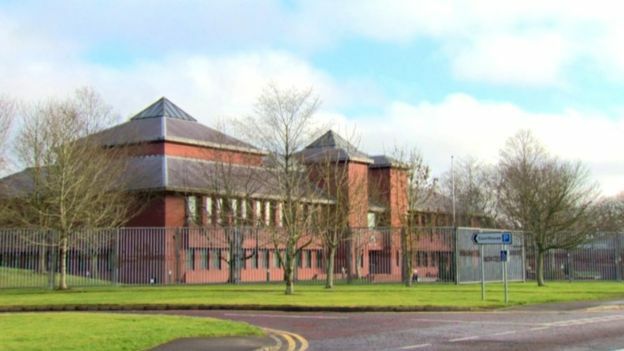 A Coleraine man has been remanded in custody charged with attempting to cause grievous bodily harm to his uncle and possessing a hammer as an offensive weapon on the same date 56-year-old Colin Doherty was found dead. Matthew Andrew Stirling appeared at the town’s Magistrates Court. Colin Doherty was found dead in the Silverthorn Avenue area of the Harpur’s Hill estate in Coleraine on Tuesday. On Wednesday police said the death was no longer being treated as suspicious, following a post-mortem. Thursday’s court hearing was told Stirling, a nephew of the deceased, faced a charge that on Tuesday he unlawfully attempted to cause grievous bodily harm to Mr Doherty. He faced a second charge of being in possession of an offensive weapon, namely a hammer, with intent to commit an offence. A detective constable told the court he believed he could connect the accused to the charge. Defence for Stirling, who appeared in the dock wearing a light grey tracksuit, asked the detective to confirm if the pathologist had concluded their examination on Mr Doherty, which he said they had. It was agreed by the police officer that “chronic alcoholism” was the conclusive cause of death. Defence alleged to the court that any evidence was circumstantial and based on accounts of hearsay. The officer said he had three witness accounts. The court heard that under interview Stirling strongly denied being in Mr Doherty’s house on the day in question; said he never struck him; never saw him and that Mr Doherty “was family”. Defence added that he had been instructed not to apply for bail until after the deceased’s funeral due to a “certain amount of tension” in the area and the witnesses and family of the accused living in such close proximity. District Judge Liam McNally said that in the circumstances he would remand Stirling in custody until Monday December 19 when he would appear via videolink at the same court. He said a bail application could be made then but the judge added that a bail address in the Coleraine area wouldn’t be considered.